Are you looking for ways to boost your engagement on Twitter and skyrocket your website traffic? 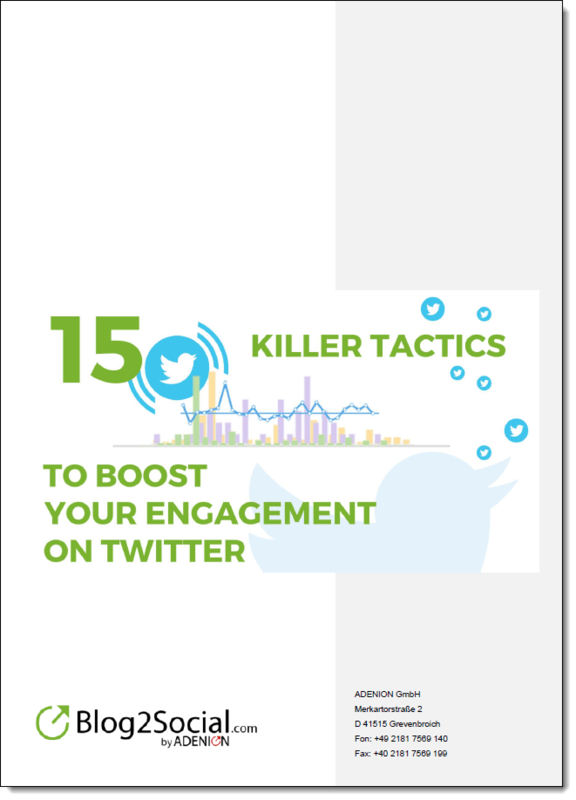 Stay tuned for the 15 most efficient tactics to leverage likes, comments, and retweets on Twitter and promote your content like a pro. With 330 million active users, Twitter is the second largest social network worldwide and THE place to be for individuals, and businesses to engage with their audiences and build their brands. More than 48% of users log in to Twitter every day. Starting with only 140 characters for each message, Twitter has relaxed the character restriction to 280 characters plus leaving more space for links and images. Twitter has also introduced videos and life broadcasts, chats, stories, polls, and many more features for communication and marketing. However, it will still keep its character as a short messaging service. Twitter was the first network to introduce #hashtags and @handles for helping users to search and find specific information and to connect with each other. The very easy way to spread messages across millions of users makes the short messaging network highly valuable channel for daily communication as well as for promoting products and services. Every second, around 6,000 tweets are tweeted on Twitter on average. This means over 350,000 tweets sent per minute, 500 million tweets per day and around 200 billion tweets per year. Twitter has also helped people to organize revolutions that toppled governments or help each other in a crisis. However, people also use Twitter for not-so-nice reasons. Spamming, fake accounts and spambots flooding the Twittersphere with fake news trying to manipulate and even to destabilize democracies in other countries, has become a severe problem for Twitter over the last couple of years. Understandably, Twitter has now enforced new rules on how users and social media applications are allowed to share and automate their tweets. 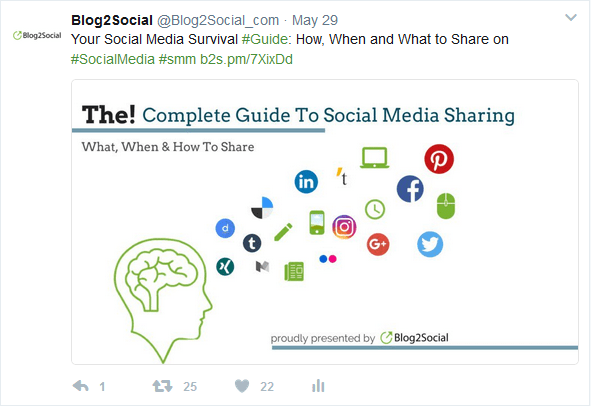 Learn what, when and how to post best to your Twitter channels to catch your follower’s attention. Content quality will remain to be the number one success factor on Twitter. Stand out by sharing high-quality content that is well-researched and helpful for your followers. When aiming at generating leads and customers for your brand or business, don’t rely on Twitter as an advertising channel. Valuable content is your currency for reaching out to your followers and prospects. Always add value to tweets. Quality content is the only thing which keeps followers interested and coming back for likes and retweets. 90% of information our brains digest is visual. A visual information is over 6x more likely to be remembered than text or audio information. Visual content tends to catch the eye faster and draws your followers’ attention to your tweets much easier than text. Since you only have 280 characters to express your marketing message, images are a great way to get the word out. Twitter started with only 140 characters for tweets but relaxed the character limit, first in 2016, excluding links and images from character count, and again in 2017 by doubling the character count from 140 to 280 characters. While images used to take up 24 characters worth of your tweet, you can now add visual content without losing extra space. And, visual content can really pay off! Research shows that image tweets generate up to five times more engagement as regular text updates. Image tweets will be automatically uploaded to your Twitter media album so your followers will be able to view your visual content not only in their feed but in the media album as well. Images in albums will generate a long-term effect for visibility and interaction. If you share a blog post on Twitter that contains more than one image, share all your blog post images on Twitter. This will extend the lifetime of your post. Sometimes, image post formats work much better for engagement than link posts, so try out both formats and analyze your results. 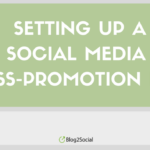 Don’t forget to integrate a link to your blog post when posting an image tweet. Videos can even outshine the most intriguing infographic. 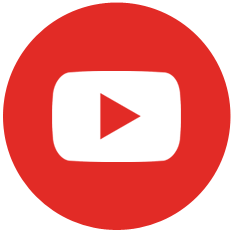 Social video generates 1200% more shares than text and images combined. No surprise, as 82% of Twitter users frequently watch video content on the short messaging network. Jumping on the video-streaming wagon, Twitter implemented its live video feature in early 2015, enabling users to directly record videos with their smartphone or upload video files no longer than 30 seconds. However, you can upload and embed any video on Twitter. The video format offers great opportunities to give your company a vivid image and drive your marketing revenues with storytelling, tutorials, live interviews or funny clips. Especially, brands aiming to engage with younger targets can profit from video clips. Try iSpring Free Cam for creating professional looking screencasts (free), or opt for Camtasia (starting from US$ 249 per single license), if you want to go pro. Sharing links is another efficient tactic to boost engagement and CTR on Twitter. By adding a link to your text or image tweet, you can almost triple your retweets. And, of course, boost their website traffic. Generally, 92% of all interactions on Twitter are link clicks. Tweets with links receive 86% higher interaction than tweets without links. But sometimes, long URLs and links with tracking codes can simply outnumber the actual message, making the Tweet less attractive. Link shorteners convert your long URLs into handy links. You can shorten your URLs with link shorteners such as bit.ly and goo.gl. 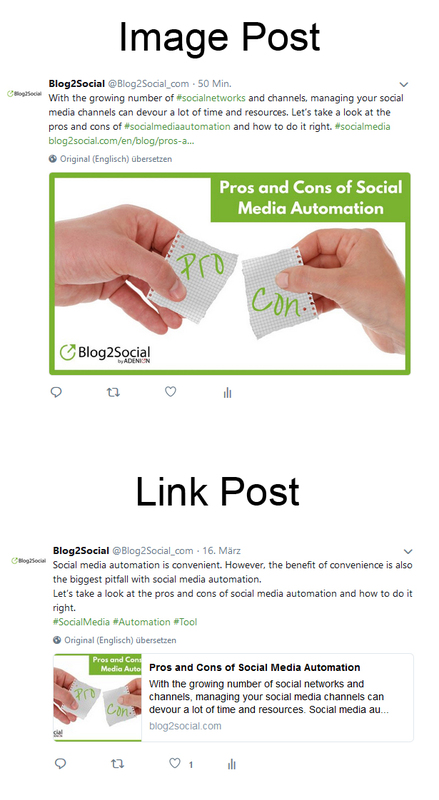 Some social media automation tools can cross-post your content automatically with shortened links, such as Blog2Social. A lot of things can go wrong when adding links to tweets. Your link can be broken or it can lead to a wrong target. Broken links can be caused by many reasons. Maybe you missed out an important bit of the URL, when copying the link, or you forgot to add a space between your text and the link. Especially, if you share shortened links, they will appear as quite cryptic, so you can’t actually see and check the target URL. Whatever the reason, a broken or misleading link will miss the target and will result in a poor user experience. So, always doublecheck your links before posting. Of course, it’s great to generate many clicks for your own content that drives traffic to your blog or website. However, social media communications should not be just about you. Think about content curation! Curated content provides more content diversity for your feed and this can turn your Twitter channel into a valuable resource of information on your topic. Curating content from important sources and influencers in your industry or niche will increase your credibility and strengthen your reputation. Mentioning sources and influencers in your Tweets will attract their attention for your Twitter channel an encourages more likes and shares for your own content. Curated content will fill in gaps when you’re running out of time or ideas for creating your own content or when you’re suffering a writer’ block. Sharing valuable content of others shows that you know your way around the industry and can help to position yourself as an expert and insider. By tagging and @mentioning the content source, you can build profitable relationships with influencers in your industry or niche, drive engagement and network with other users. Reaching out to influencers by means of content curation will increase attention, likes, and shares for your own content, and send more traffic, new readers and potential customers to your site. 3 pieces of created content: This is content you have created, this can be promotional, but should still be relevant to your audience. 2 pieces of personal content: This should be content that gives your brand a human touch. This can be fun and entertaining content or personal statements and comments. Content which has performed well in the past and content with information that is still valid and useful is too valuable to go stale. Don’t let your high-quality content dust in your archives. Re-share your evergreen posts, videos, and graphics on a regular basis. Twitter is so busy, many of your followers will have most likely missed your tweet when you publish it for the first time. The lifetime of a Twitter post only lasts 18 minutes. Afterward, your content will go down unread in the never-ending stream of new Twitter messages. So, it is a good idea to recycle your content from time to time. However, the new Twitter rules are quite clear about posting the same content on one or across multiple accounts. But Twitter still allows retweets and, of cause, you can recycle your content for resharing. So, when you reshare your content, always spice up your Tweets and vary your comment a little, using different texts, #hashtags, or include different images, or use different post formats (link posts and image posts) when re-posting your content. Even, for retweets, add different comments. Turn long posts into a white paper or ebook. Write a checklist for your content. Create an infographic for your content. 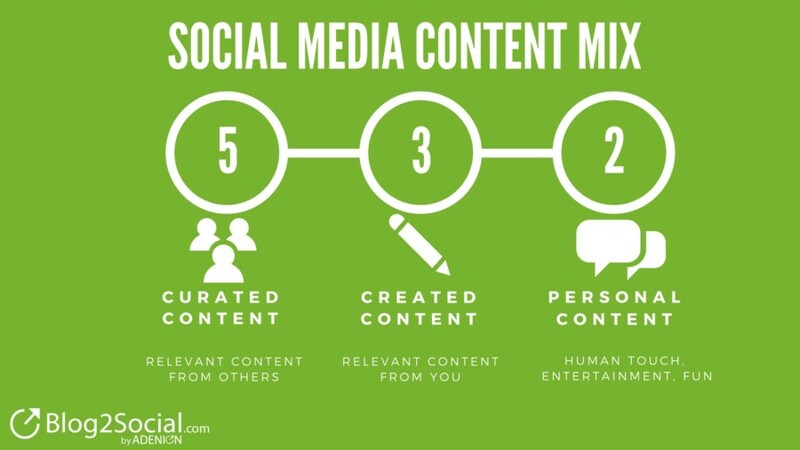 Use all these content pieces to re-share your content on Twitter. Note: not every content is recyclable. Beware of retweeting or recycling outdated content or messages referring to trending topics that are no longer trending or former current event, and don’t reshare last season’s holiday greetings. A good tactic to keep your evergreen content alive is to pin tweets to your profile. A pinned tweet will stay visible at the top of your feed until you remove it again. If you have current high-quality content you want to promote, pinning it to your Twitter profile can leverage your engagement-rate immensely. Pinned tweets basically work like an ad on your Twitter profile. Take advantage of this free-of-charge advertising feature by including a strong Call-To-Action and an intriguing graphic. What Boomerang is to Instagram, motion GIFs and memes are to Twitter. The funny images and short clips are great for entertaining your followers. They are the kind of “personal content” to spice up your feed. Especially, on Fridays and during the holiday season, motion GIFs and memes are extremely popular and will grab your followers attention right away. And, Twitter also makes it extra easy to post motion GIFs. 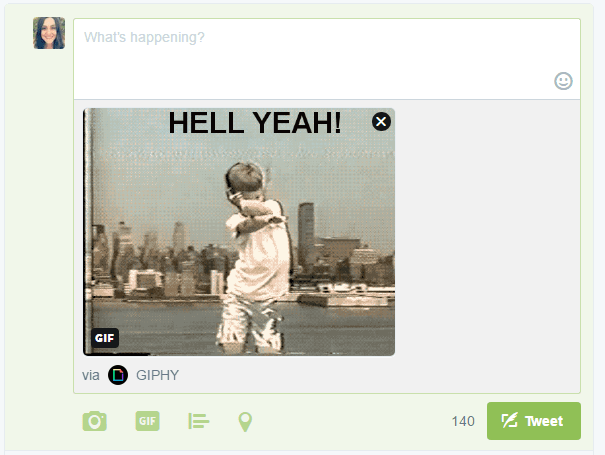 Simply click on the GIF-Button in your tweet box and select the one you like! Try tools like Giphy, GIFMaker.me or Flipagram to create Gifs for Twitter. You can also use Canva to convert your images into motion GIFs. On average, Twitter users visit the network thrice a day, but only for a couple of minutes. So, the right timing can be crucial to your success on Twitter. Studies show, that engagement-rates, as well as CTRs, directly relate to the numbers of followers seeing your tweet when they scroll by. Knowing your target audience’s peak hours on Twitter and can have a major impact on your Twitter performance. 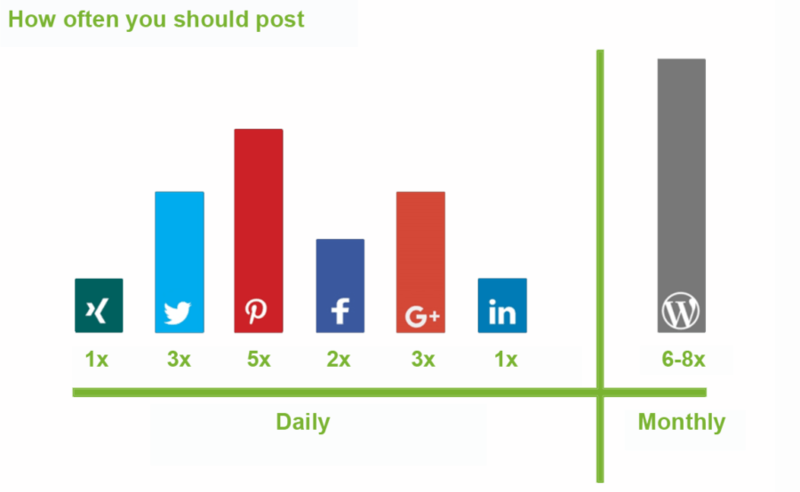 If you have no idea, start by looking at the general best times and frequencies to post to Twitter, based on research. 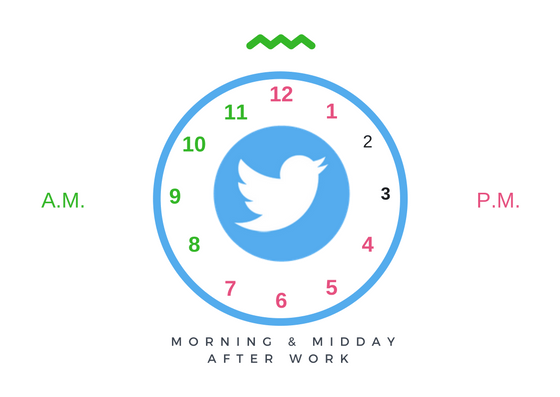 The Twittersphere is most active during the daytime hours between 8 a.m. – 7 p.m. in your respective time zone. Tweets posted during that time will generate 30% more interaction. Tweets on weekends generate 17% higher engagement than on weekdays. Nevertheless, being familiar with your audience and knowing your followers’ preferred Twitter times is very helpful when trying to boost your reach. So, look at your stats and try different times to see, what works best for you. Social media automation tools can help you to schedule your tweets at the best times, even during off-office-hours, on weekends or when you’re on holiday. This can make your social media management a lot easier. Especially, when you are promoting in different time zones or when your target audience is less likely to be online during your working hours, you should try scheduling your tweets with the help of social media automation. The average lifespan of a tweet only lasts for 18 minutes. In order to get as many eyeballs as possible for your message, you need to share your message more than once. But tweet with care and by regarding the new Twitter rules. Posting too frequently can annoy and drive away your followers. Tweeting three times per day will get the best results for engagement. Always vary your tweets with different comments, images, #hashtags or @handles if you reshare your posts. The bigger your brand, the busier you will be on Twitter. Keep an eye on your users’ engagement with your messages and look out for mentions, retweets. Respond in time. Saying something as simple as “Thank you” will do the trick in most cases. Actively engaging with your followers pays off in the long run. Responding personally will show that you care about what your followers do with your messages and what they have to say about them. Active engagement will also help you to get in contact with influencers and potential customers. If you receive a negative response on Twitter, reacting right away should be your priority. After all, being open for discussion is an effective and powerful tactic to build a community and a positive image for your brand. People who have received responses to direct mentions also tend to engage more actively with your content in the future. A response as simple as this one shows commitment and will leave the other person with a positive image of your person or brand. The character limit for tweets has doubled from 140 to 280 characters. However, Twitter is still a short messaging network, so keep it even shorter! Even after launching the new character limit, most people stick to short messages. Only 5% of tweets are crossing the 140- character-limit, 2% are over 190 characters and only 1% is hitting the 280-character-limit. Studies have shown that tweets around 110 characters increase interaction up to 17%. Tweets of about 80-110 characters are the ones working best to leverage engagement. For a simple reason: shorter messages make it easier for followers to retweet a tweet. 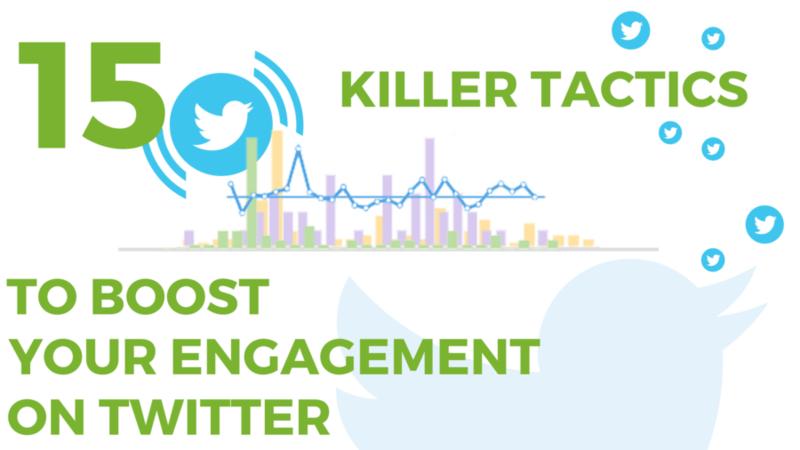 By leaving enough space for comments or @handles, tweets are more likely to be retweeted. Hashtags have become such an essential part of tweets, that you hardly see any tweets without them. Hashtags make it easier for your audience to find your tweets by searching for hashtags or keywords so adding hashtags can help you to get more attention for your tweets. Adding hashtags is, in fact, a key tactic to grab attention and interaction! By adding hashtags, your tweets will be 2 x more likely to get retweets than tweets without hashtags. However, as in life so on Twitter, less can sometimes become more. Use hashtags with care and don’t them. Too many hashtags in your tweet can make your message difficult to read and grasp. Stick to 1-2 hashtags per tweet to get 21% more interaction. Engagement decreases the more hashtags you use. Using trending hashtags is a common practice for newsjacking on Twitter, but it has also become an indicator of hashtag spamming. You can use trending hashtags to get more attention for your tweets, but use them only if they have a direct reference to your message. Curating content from others can push your engagement rate. The same goes for using handles on Twitter. By mentioning a fellow marketer or an influencer or expert in your industry, you can expand your own reach. Mentioning @handles in your tweet will improve your chances of receiving likes, retweets, comments in return. It can increase your followers base and build up your network. In fact, tagging influencers or industry expert can skyrocket your impressions and clicks, as your tweet will appear on the mentioned feed as well. So, remember to tag other Twitter users, when sharing or commenting their content or when replying to it. They will notice and most likely respond with a like, a retweet or a comment in return and this will push your tweets as well. Don’t just push out messages on Twitter, but also try to generate conversations. Creating a Twitter chat is a great opportunity to start a real time conversation with up to a thousand users at a time! Chats gather people of similar interest around a unique hashtag – the perfect stage to display expertise on a topic. If you are unsure how this can work out for your business, start by participating in an existing Twitter chat on a topic you know. Don’t be shy on Twitter! Using clear and direct language as well as including strong call-to-actions (CTAs) such as “please retweet” can have a tremendous impact on your engagement rate. In fact, tweets which include CTAs directly asking for RTs are getting retweeted 23% times more than tweets without. There is no need to be poetic on Twitter, try to make your message as clear and up-to-the-point as possible. If you have a great article to share, say what it is about. If you want your message to get shares, say so. Asking questions is a classic tactic you can find in every engagement guide. For a good reason – it simply works. Everyone likes to be asked and to give an opinion. If you have an active community and engage regularly, asking questions will even work even better for you! If you show that your follower’s opinions matter to you, you can ask any question you like, even an absurd one and you will get a response. When sharing links to your blog, always ask your audience for their opinion. To engage with your audience for your brand ask what they like about your product or service, or new features you are introducing. Ask your audience about their opinion on current events, trends or developments in your industry. By getting feedback from your audience, you will not only boost your engagement but also get a better insight into what your customers are looking for. To create extra engagement, try out Twitter’s interactive polls feature to ask for your followers’ opinion. 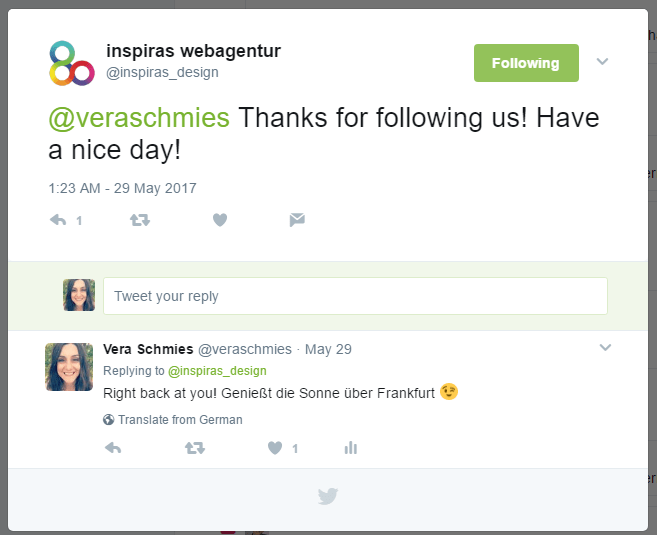 It’s a great way to interact with your followers, receive valuable feedback and show that you care about your followers. Successful Twitter marketing can take up a lot of time. With the use of social media automation tools and plugins for scheduling and sharing your posts, you can make your life much easier. 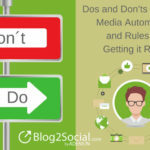 However, there are pros and cons of social media automation and there are automation rules you should stick to. In March 2018 Twitter has enforced several significant changes on sharing and automation policies. So keep this in mind when choosing your social media automation solution. There are plenty of automation tools and plugins promising to do the marketing job for you, but not every one of them will help you perform efficient tactics. Simply broadcasting the same content in the same form multiple times can drive away your followers and destroy your reputation. The social media tool and plugin Blog2Social is specifically designed to cross-promote your content on Twitter as well as all other popular networks automatically, but at the same time providing multiple options to customize and tailor your social media posts for each network and each community. 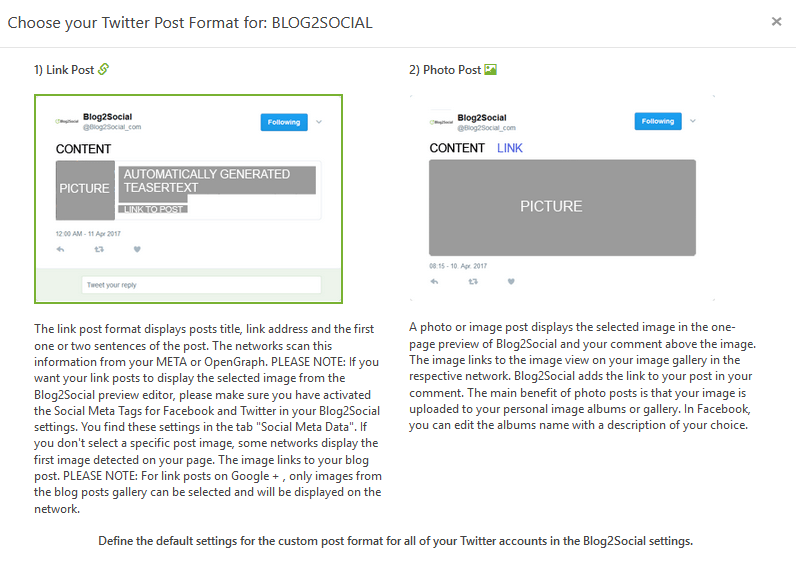 With Blog2Social you can very easily vary and customize your tweets by adding individual comments, selecting individual images and post formats, and even changing your Twitter Card meta tags. This is how you boost your engagement in just a few clicks and right from your blog or browser. To make your tweets more personal and engaging, you can customize your tweets with individual #hashtags and @handles. 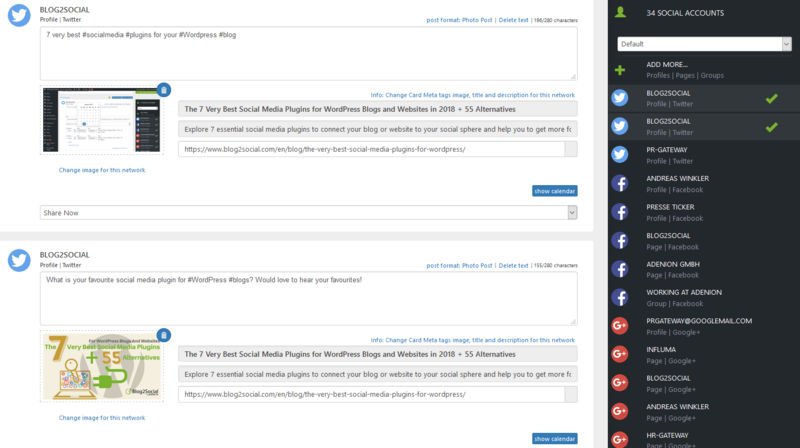 The “Custom Sharing & Scheduling” option of Blog2Social allows you to individually edit multiple tweets at a time in a one-page preview editor. You can customize the pre-filled text and add hashtags and handles, separately for each tweet and each Twitter account. 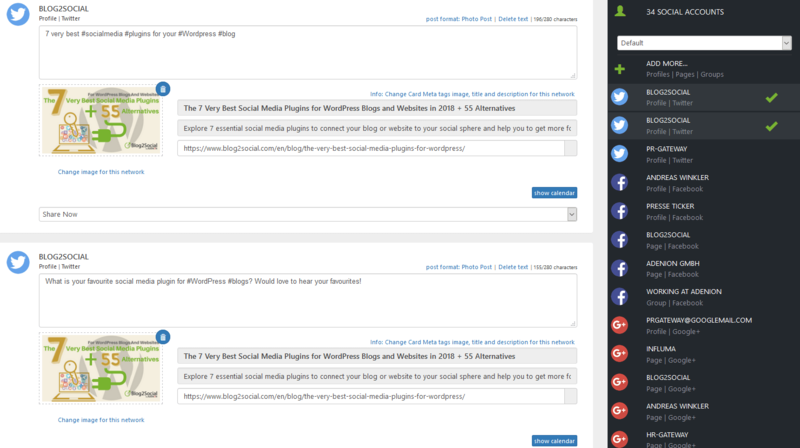 Blog2Social also provides you with individual comment fields for each of your tweets. This allows you to schedule and share multiple posts on one Twitter account or across multiple Twitter accounts with individually tailored comments and retweets. If you are ready to go, just click “share” and your tweets will be send out in an automatic delay mode to prevent mass posting, or at your scheduled times. 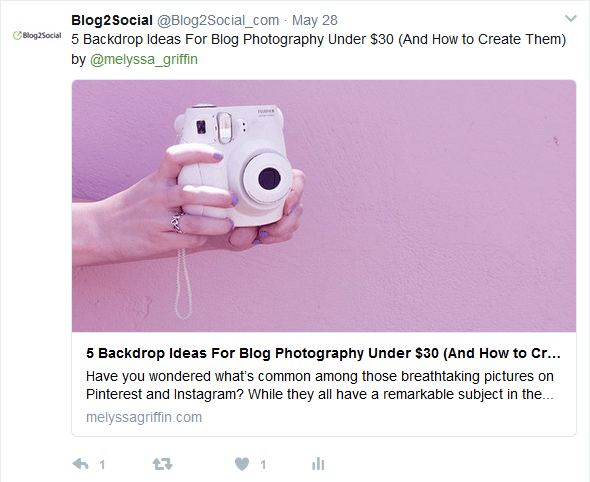 By standard sharing, your blog posts will be shared with your featured image or the image defined in your Twitter Card parameters. 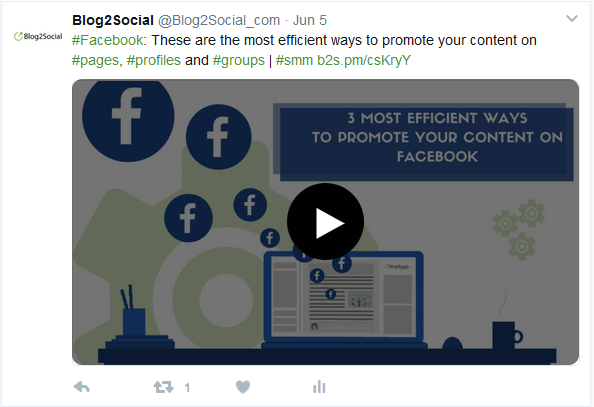 If you want to share the same blog post more than once or re-share your evergreen content repeatedly, you can vary your posts by selecting individual images for every tweet or scheduling unit. Blog2Social lets you select any image from your blog post or media library for your tweet and even gives you the option to upload more images from your computer or device. With a simple click on the displayed image, you can change the pre-selected image for any of your preferred photos or graphics to trigger attention and engagement. 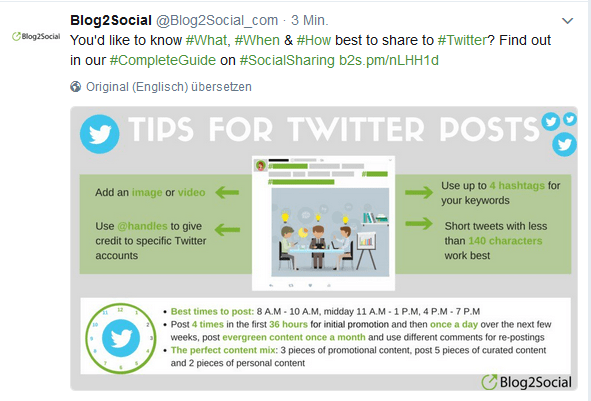 With Blog2Social you can share your blog post as link post or image post tweet. An image post tweet clearly focuses on the image and enables your followers to view your photos or infographics right in their feed. All images from your image posts are automatically uploaded to your Twitter media gallery. So, your followers can still find your graphics even if your tweet has long vanished ways down in your stream. 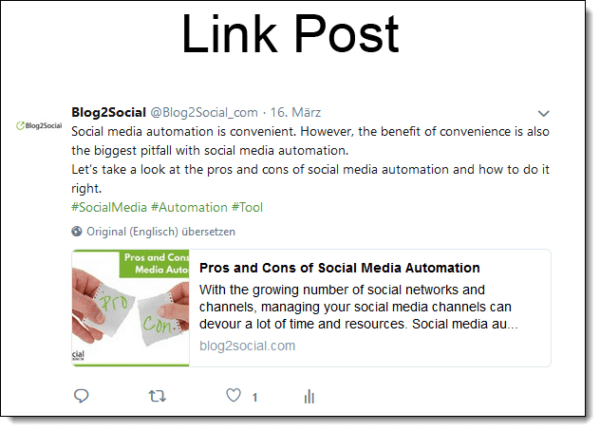 A link post tweet, on the other hand, generates an automatic preview and forwards your followers straight to your website as soon as they click. Both formats work great for Twitter, but for some purposes, you might want to make sure to use a specific post format for your post. And, this option also gives you more choices for varying your tweets for reposting your content legitimately on one or across multiple Twitter accounts. To do so, simply go to “Settings” in your Blog2Social dashboard and select the tab “Network Settings”. Here you can select whether you want your blog posts to be shared with a link preview or as an image tweet with an individual comment containing the link to your website. You can select the post format as default setting but you can also select to change the post format for each individual tweet on the preview editor. By sharing your tweets at the best times you can catch the time slots when followers are most active. This will increase the likelihood to grab their attention when you appear in your follower’s feeds. To tweet during Twitter’s peak hours, you can schedule your tweets automatically with the Blog2Social Best Time Scheduler. 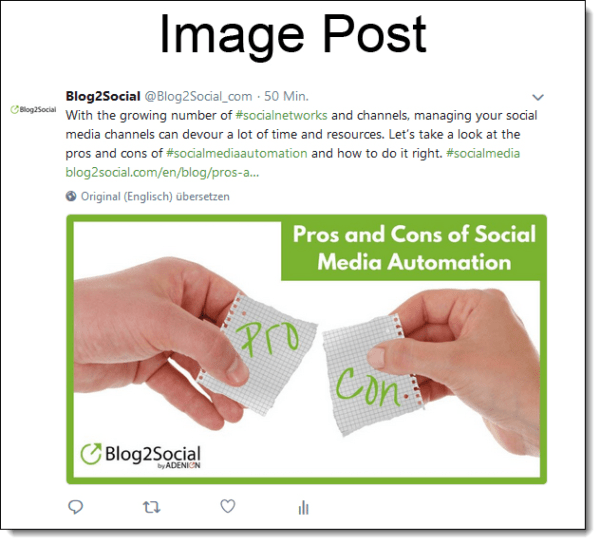 For your convenience Blog2Social provides a ready-to-use pre-configured Best Time Scheduler you can apply with a simple click. If you know which times work best for you, you can also save your own preferred times as Best Time Settings for automatic scheduling and schedule your tweets according to your custom time settings. This can be handy, especially if you promote your products or brand internationally and across various time zones. If you want to set up recurring tweets for your blog post, you can set up various recurrent scheduling schemes for up to one year. You will be asked to add multiple tweets with variations for each comment to prevent duplicate content on Twitter. You will also be able to re-share each tweet once to your own account and once to other accounts you manage. 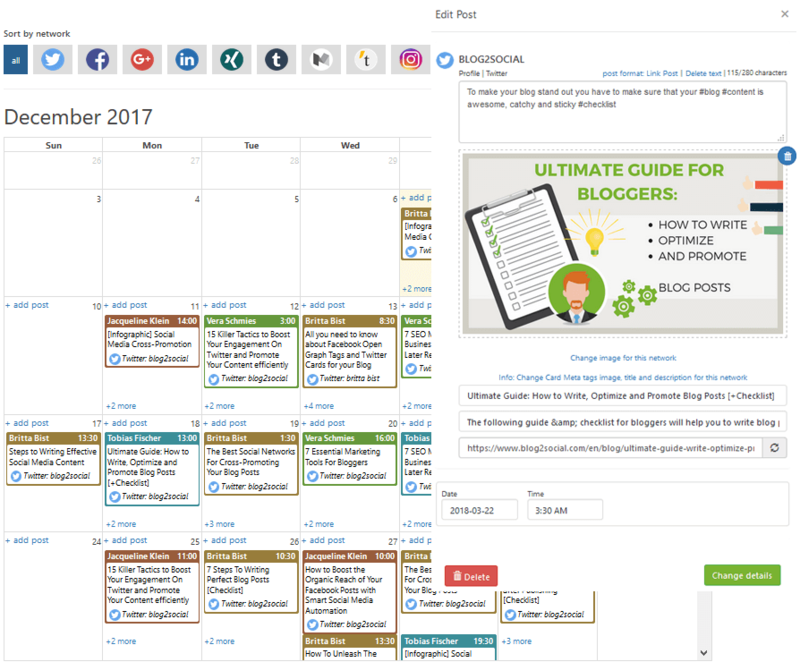 The Blog2Social Social Media Calendar helps you to keep track of your tweets and to edit and add them per click or to change times and days per drag & drop. This makes it easy for you to plan and promote your content with multiple tweets across multiple social media accounts. 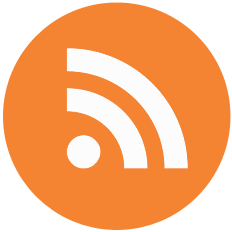 The same works for resharing your older evergreen content or for planning tweets of not yet published blog posts. Seems like too much effort for a few retweets? Alternatively, you can just activate the Blog2Social auto poster and the plugin will share everything you publish on your blog directly on your Twitter channel. 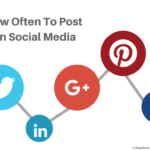 However, to boost your engagement, it takes just 5 minutes of your time to customize your posts. 30% increase in engagement if you tweet during 8am-7pm. The weekend will generate another 17% increase in engagement compared to weekdays. Make your tweets about 100 characters long, add an image, a link, one or two hashtags or a handle and tweet during 8am-7pm and weekends. Don’t try to sell products all the time, but share quality content, your own and curated content from influencers, become part of conversations and build relationships. Focus on your reputation and your image and this will drive your sales automatically without ever-repeating sales pitches. While all these tactics will have their effect, try them out one at a time and monitor your engagement, retweets, likes, and comments. Each community is different and your audience might have very special preferences. So, take your time with trial and error and analyze what works best for you and your brand. Do you have other tactics to add to this list? Let me know and leave a comment, I am keen to hear your opinion! Re-sharing the old content is really a great idea, just need to update tweet with followup. Thanks for the tips, it really help business to explore twitter to its full potential for engaging more traffic. I am happy you found this post useful! 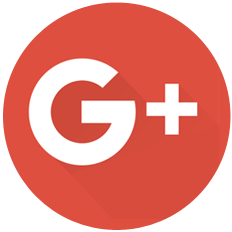 Let me know how re-sharing your old content worked out for you and if you gave any of the other tips a try. I am always curious! Our secret is – its team work! This is a corporate blog, and we are a couple of social media and marketing experts who are passionate about blogging and valuable content. great post! I really enjoyed reading this and I am pretty sure that it will be useful for me to help in my work. cheers, Vera, for sharing this blog. I’m happy to hear you liked my post! Wish you all the best for your work! Thanks for the thorough and easy to follow information. Years into it and I admit that Twitter still baffles me! Thank you so much for your comment. We are glad to hear that you liked our tips. Thanks for this informative article. 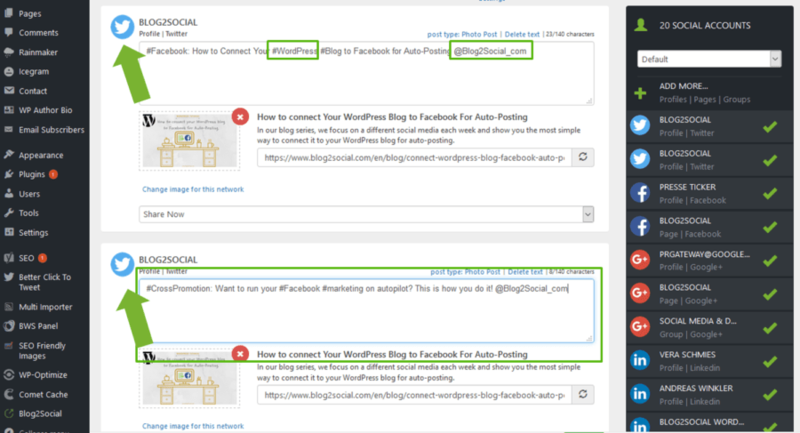 I already use Blog2Social Plugin on my blog. Thank you for your comment. 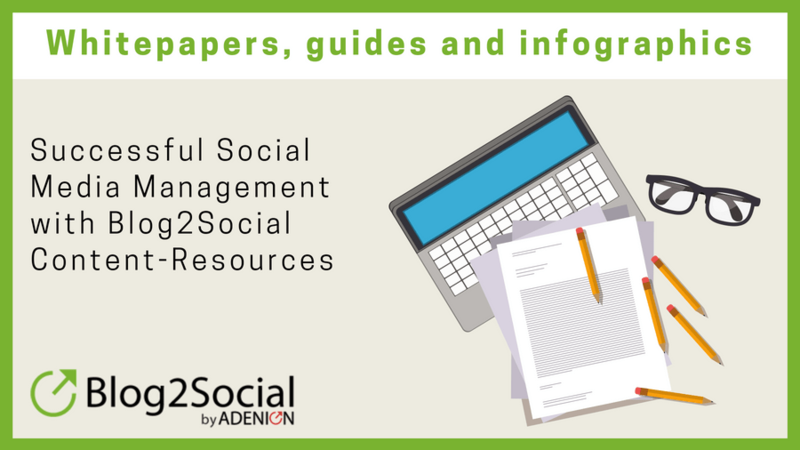 We are glad to hear that you liked our article and that you are using Blog2Social. thank you so much for your kind words about this article! You are absolutely right, sharing and re-tweeting your content on Twitter is a perfect way to build a follower base and reach out for potential customers. Adding attractive images to your tweets and visualizing content are also two key points for driving more traffic to your Twitter account and blog. We are very happy to hear that you like the information we give and even they way it is presented to you. We always want to support people in their efforts by providing useful and informative content to you. Your feedback is a great compliment to our work, which we will continue this way 🙂 .